The curves in the road lulled me to sleep, but I awoke with a jolt when the van left the pavement and lurched onto a washed out dirt road, littered with potholes. Dwayne parked abruptly and let us out. He pointed down a dirt path at awaiting white pangas and told us he would wait. The path beckoned us to the lake’s edge. Grass green foliage of the overarching trees blocked all but small windows of the bright blue sky. A speckled light and a crisscrossing mosaic of tree branch shadows danced on to the grass and path below us. A stout man with a wide reaching smile gestured us into his panga. “My name is Alex.” He smiled and guided us out of the reeds and onto lake Naivasha. The wet season in Kenya had just ended and the lake’s waters had overflowed the banks and flooded the surrounding acacias. The brown water offered a wavy mirror to everything above it. Trees, birds, and passing tourist boats had their reflection echoed back on the slightly textured surface of the lake. 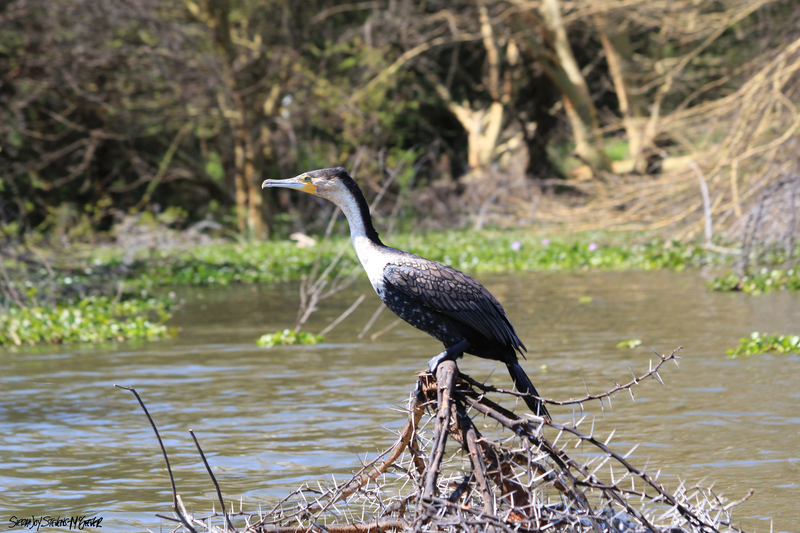 A reed cormorant, perched on webbed feet, surveyed the lake with vivid teal eyes from a low-hanging, arched branch. Its head and neck, brown on top, white below, was cocked slightly to the left. The light caught the yellow patch of skin between the end of its hooked, predatory beak and the feather’s beginning. Black rimmed, brown feathers glistened marvelously on the bird’s back and folded wings, perfectly layered on top of the long dark flight feathers. Great white pelicans swam silently in small groups, testing the waters for fish with their long beaks, pouches ready for a catch. Though their morphology paints them as the lighter twin, the behavior is unlike that of the familiar brown pelicans back home—who plummet heroically from the air at great speeds, plunging deep into the ocean after fish, surfacing with extended pouches, a flopping fishtail wriggling out the side. The great white pelicans will work in groups, sculling on the waters surface, to chase schools of small fish into the shallows where they are easier to catch. Alex steered the boat too close to one and it laboriously heaved itself off the water on long, thick wings, its yellow feet held out behind a pointed fan of tail feathers. 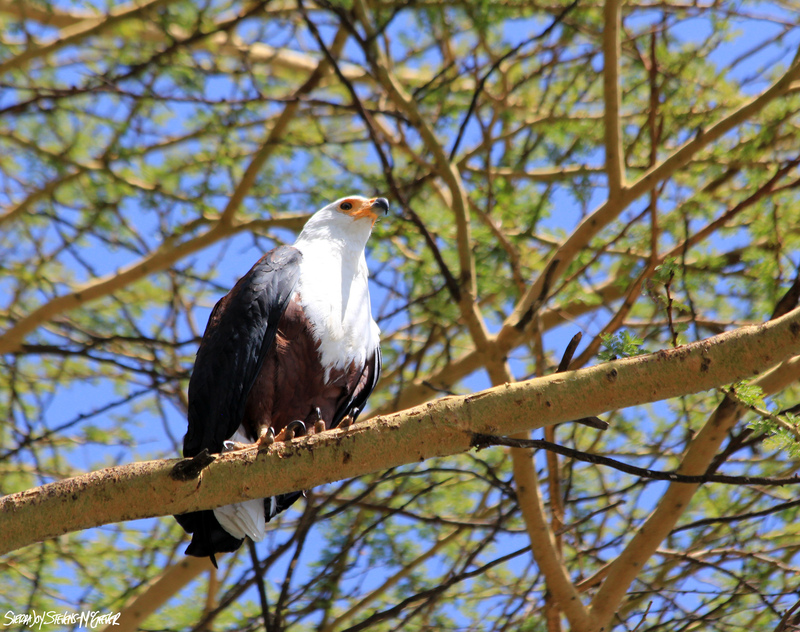 The bird life at lake Naivasha had me convinced I could become a birder, if I lived in Africa—so many beautiful, interesting species, and easy to see. I get frustrated birding at home because I can never see anything. Enthusiastic friends will point frantically, “Right there between the big branch and that smaller one. Don’t you see it?” And I will look into the patchwork of small branches intersecting bigger ones and see nothing more. But here there were birds everywhere I looked—Egyptian geese with masked eyes, graceful great white egrets, gray-headed gulls with blood colored beaks, gray herons, a Hadeda Ibis with a small head and a long cured bill, an African fish eagle, the pelicans and reed cormorants, a lone black crake, yellow billed ducks, more birds than I could keep track of. Dave enthusiastically put check marks in our book, The Wildlife of Southern Africa, next to each species we saw. Alex cut in and out of the flooded forest slowly, searching for birds to tell us about. Beyond the trees, waterlogged cactus sprouted from the lake’s surface, the swollen flesh, studded with sturdy spines. A lone pink flower caught my eye, opening towards the sun. I saw it first in the reflection of a spiny thicket, protected from the slight breeze, it was reflected perfectly here, against a blue background indicative of the cloudless sky, not the murky lake. On an island in front of us zebra, impala, waterbuck and blue wildebeest grazed peacefully in an interspersed herd. The distinct head of a giraffe surfaced above the canopy beyond. “That’s fine. It’s lovely on the lake.” And it was. A soft breeze combated the pressing sun just enough to make it perfectly comfortable. 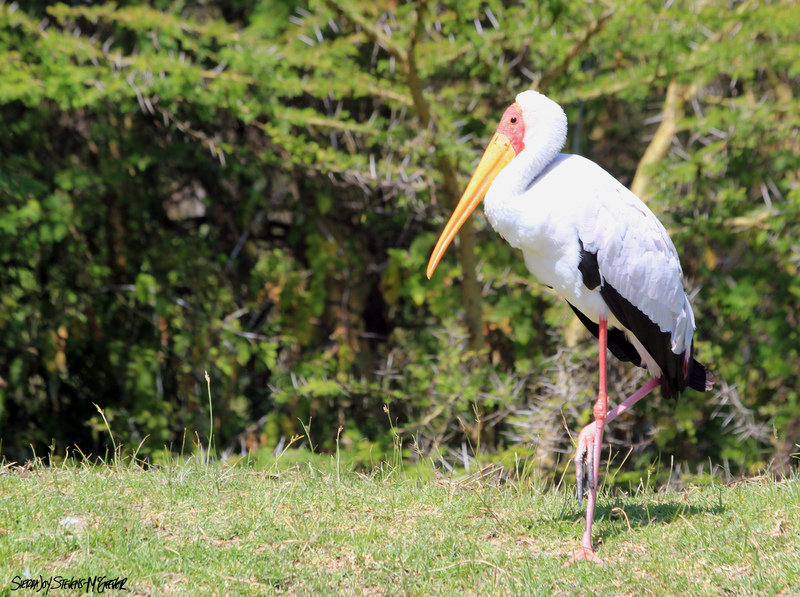 A few yellow-billed storks stood on one leg along riverbank. 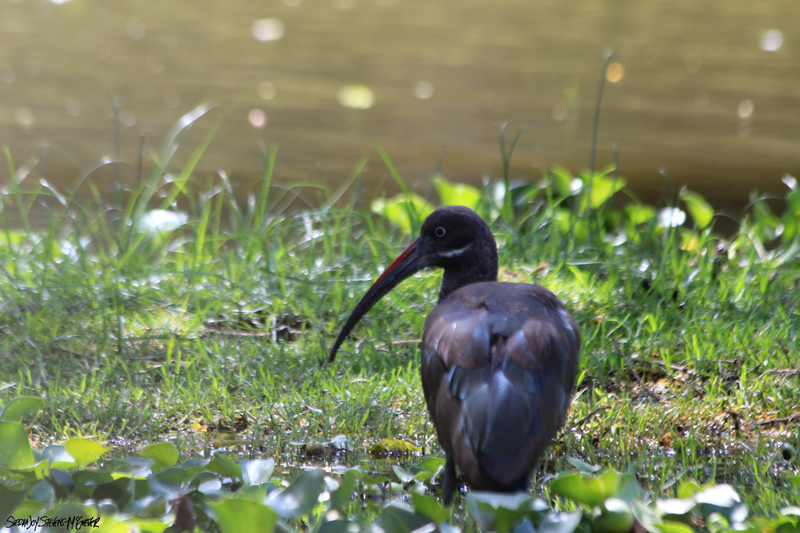 The other leg stirred the dark water flushing potential prey towards long yellow beaks, which contrasted brightly with their white bodies and black tipped wings. The deep red, bare skin on their face wrinkles in way around their dark eyes that makes them all look like old men. On a small tree, another stork perched comically on pink legs too long for a proper roosting posture. The bird looked top heavy and uneasy. On shore we spotted two gray crowned cranes feeding in the reeds—beautiful, endangered creatures with vivid golden Mohawks. The Great Rift Valley is the result of normal faulting caused by extension of the continental plate. The reason for this is still being debated in the literature. There is evidence that cormorant feathers are less water resistant than other water birds due to their structure, thus cormorants need to dry their wings least they become waterlogged. 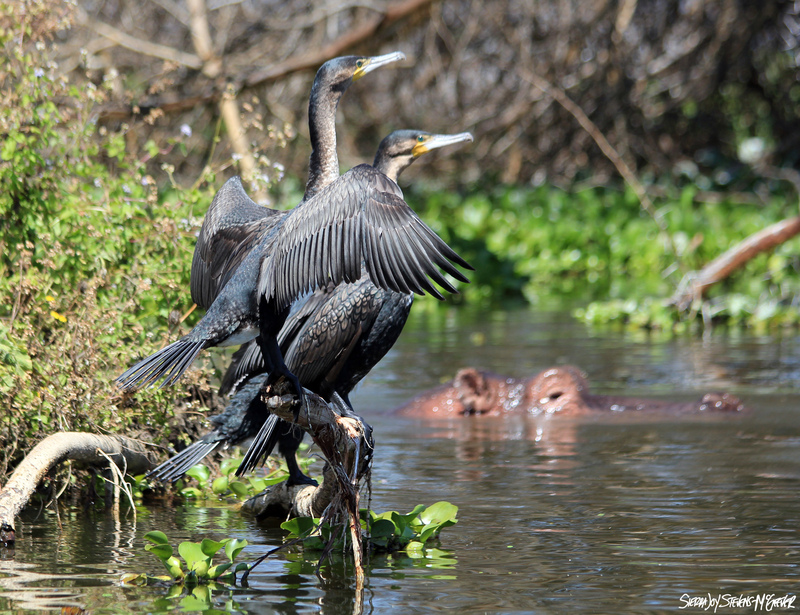 However, conflicting studies have shown that cormorants do not hold their wings out long enough to dry. One study found that the outspread wings stance correlated to previous fishing success, while others suggest it’s a social cue or done to optimize spacing for later take off. Hippos spend most of the day in the water, coming on land during the evening to feed. Coming between a frightened hippo and water (its safe place) might be the most dangerous situation you could find yourself in in Africa. These massive vegetarians can be aggressive when threatened and their 20-inch canines are nothing to be reckoned with.